Are our efforts to help others ever driven solely by altruistic motivation, or is our ultimate goal always some form of self- benefit (egoistic motivation)? This volume reports the development of an empirically-testable theory of altruistic motivation and a series of experiments designed to test that theory. It sets the issue of egoism versus altruism in its larger historical and philosophical context, and brings diverse experiments into a single, integrated argument. 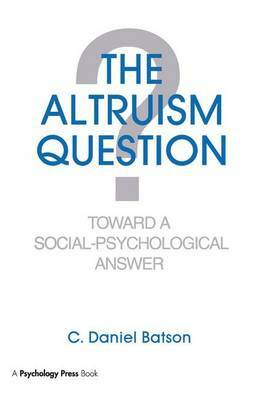 Readers will find that this book provides a solid base of information from which questions surrounding the existence of altruistic motivation can be further investigated.